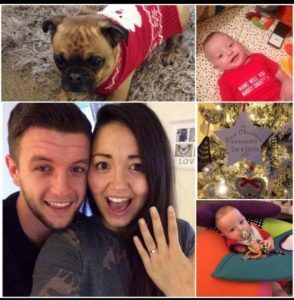 Our wedding blog 🙂 We met at university when we were in the same social group. Tom asked me to go down to Cardiff Bay for our first date. As we were walking he turned and asked me was there was something in my eye, i shut my eyes and he planted a kiss on me and we never looked back! – It was our son Oliver’s first Christmas. Tom had woken first and gone in to check on Oliver. He called for me to come and see and as i walked over to his cot he was wearing a vest saying ‘Mami will you marry Dadi?’ As I looked down he was one knee. Of course I said yes! If there’s any advice we could give is to use a planner and make sure you’ve covered everything and leave enough time to sort these things because the wedding industry is a busy one! 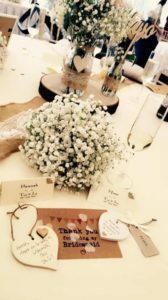 – We knew we loved our colour theme (beige and navy) from seeing pictures of other weddings online. 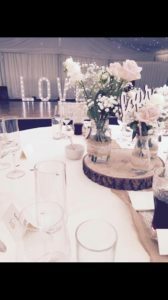 We wanted small centrepieces and we loved the idea of wood and rustic themes. We then planned our flowers, cake and decor around the rustic colours and used ideas from Pinterest! – Kathryn’s hair studio did all of our hair. They were amazing and considering Kath is my new mother in law, she was very patient with me! We used Sophie Woodward make up. She was absolutely amazing! Her make up was flawless and she was able to create a look for somebody as fussy as me and was so kind and patient the whole way through! Both highly recommended. 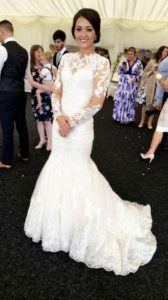 – My wedding dress was from Emma Phillips Bridal in Carmarthen. I knew what type of dress I wanted before I went looking and Emma Phillips was the first and only bridal shop I went to. They understood exactly what i was looking for and brought me a range of dresses within my dream idea. I choose the dress straight away and they were all so kind and helpful. Absolutely amazing!! 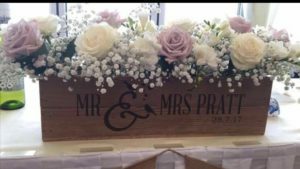 – Our beautiful flowers were made by the very talented Claire Bunyan based in Llanelli. Claire supplied bouquets, buttonholes, our whole centrepiece set ups, fresh flowers for the cake and a candy cart. She was wonderful from the word go and we were so pleased with everything on the day. Ocean view was amazing. From the word go we were supported by Lynne and of course Caren our wonderful coordinator. Caren was more like a friend to us and saw to everything we needed and wanted. We had a few bumps along the way and both Caren and Lynne both supported us and helped us to sort things out. We were able to stay in the cottages the night before and enjoy time with our families before walking inches to our wedding ceremony. It was a beautiful day and we couldn’t recommend the venue more!